Running out of digital space is quite common nowadays. It is very difficult to choose which photographs or videos should be deleted for more space on your drive or which documents should be erased to allow new documents to be saved. You need not worry anymore as there are plenty of mind-blowing free cloud storage providers who will take care of your entire extra load. We shall speak about the top ten free cloud storage providers who can safely be trusted with your personal data. Free Cloud Storage That Are Worth Your Time. Cloud storage has become a necessity today. Not just professionals, but even schoolchildren, as well as college students, need it to share documents, files, and many other digital data online. Instead of saving important data, documents, photo albums, etc. on a hard disc or pen drive, it is always better to choose online cloud storage. You could share data, photos, or videos with anyone you wish or even access it from anywhere, anytime. Many cloud storage providers not just give you ample of space to store your data, but also provide ample of other features and bonuses. A few of the big players offer free services. Let us have a look at the top ten free cloud storage providers that will catch your eye. So, 2 GB ain’t enough for your needs? Switch over to pCloud. They offer 10GB storage for free. And if you rope in your friends or complete a few other steps required, you get 20GB storage free. And what makes it more endearing? Well, it has apps for Windows, Mac, iOS, Linux, and Android. The web interface is user-friendly and allows you to access files from any computer without installing a client. You can even invite your friends, family, colleagues to access certain folders for viewing and editing. After you have shared your data, you can easily revoke the rights as and when needed. Sync.com offers new users 5GB storage and with every referral the user can earn additional 1 GB. And when your friends sign up using your code, they get an additional 1 GB too. It has apps for Windows, Mac, iOS, and Android. What makes Sync.com unique? Well, you no longer need to store files on your local hard drive. Any single change in any file on your computer will be updated in Sync.com and thus, you can happily erase unwanted data on a small data to free up space. Next in line is Symform, who also offers 10GB storage for free. This is a peer-to-peer cloud storage service. It offers 10 GB initially and allows one to earn up to 5 TB. You can earn more space by contributing the excess hard disc space on your computer; you get half the amount you contributed in the free cloud storage. The Russians have come up with a suitable answer to Google Drive. They offer 10 GB free cloud storage. You can earn up to 20GB more by referring friends. Friends who are invited earn 1 GB extra space and the referrer earns 500 MB. Okay, MEGA does mean mega storage. It offers 50 GB free cloud storage space! It claims it has as zero-knowledge privacy along with client-side encryption. This means, keep your passwords safe, as there is no reset button. However, MEGA does not seem very secure and users have complained of bugs that can lead to loss of data. Still, in its baby phase, Degoo does not offer file sync or share options. It is limited to Windows, Mac, and Android. Yes, there is no iOS app as yet. So, why do we mention it here? Well, it offers, 100GB free cloud storage capacity. Huge, isn’t it? It is about 50x what Dropbox offers. It even allows you add 500GB free by bringing in your friends. You earn additional 3 gigabytes per invitation accepted. hubiC is like the new kid on the block. Although it does not give the massive storage limit as Degoo, its 25 GB free storage comes along with many perks. This includes apps for Windows, Mac, iOS, Android, Linus, BlackBerry, as well as Windows Phone. You can even install third party apps to improve your cloud experiences such as Swift Explorer, Expandrive, and Synology Disk Station Manager 5.1. OneDrive offers 5 GB space to its users. It is fast and reliable service that comes free with a Windows account. There are many sharing and collaboration options available that make it easy to share files online and edit them with your team. Even though DropBox offers just 2GB free storage, it is one of the most popular services on the market. The apps are so easy to use that even a toddler can operate it. It allows quick sync across devices that are on the same Wi-Fi network. And as an added bonus, every friend referral earns you 500 MB and 125 MB for connecting Facebook or Twitter. The best and the most sought after free cloud storage provider is one and only Google Drive. It offers 15 GB free storage and has no bandwidth limits. It allows quick and reliable syncing and even supports file versioning for all files. However, hubiC, MEGA as well as Sync.com do better in terms of space and features. But, Google Drive hits the no.1 spot as it allows you to share your Gmail and Google Photos on it. 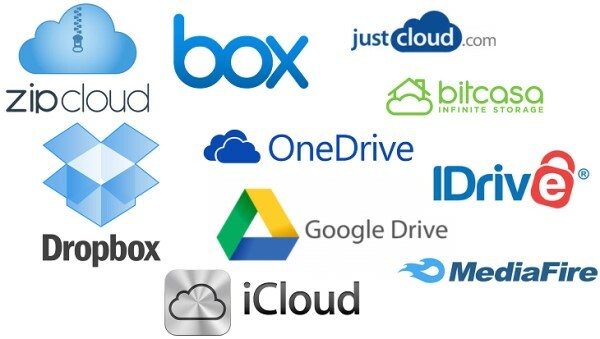 These are the top ten free cloud storage providers who offer great features for free. If you are running out of space on your drive, then do create an account on either of these big players. You definitely won’t regret your decision. Cloud can be good for certain thing. DEfinitely not for file sharing. Binfer bypasses cloud storage servers. This is the best way to send secure files. The link is http://www.binfer.com. A great top Ten Free Cloud Storage Providers list! I was waiting for to get such kind of list. At least, I ave gotten it. For Free cloud-CAD try it now. Thanks for the head up!